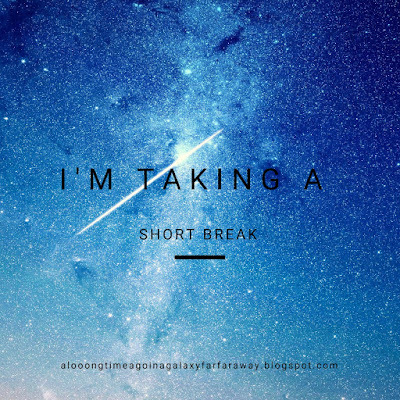 Ceci Creates: I'm taking a short break! So my conscience has finally gotten the better of me and I have to tell all of you that I'm taking a break until August! I'm perfectly fine but I'm in the process of creating a schedule and upping a lot of things I hope to be done by August so I can start posting again by then. (I also hope to have the first episode of my podcast done by then....) I know I haven't answered any of the comments in the last two posts, and I will do that soon! But I just wanted to let you know. Two great friends of mine and me started a book blog called Southern Belles' Book Club and we would be so grateful if you went to check it out! There aren't any reviews up yet, but I'm working on one! Thank you all! Have a great break! We'll miss you!!! Have a great, refreshing break!! Aww we’ll miss you! Looking forward to seeing you againnnnnnnnnnnn.